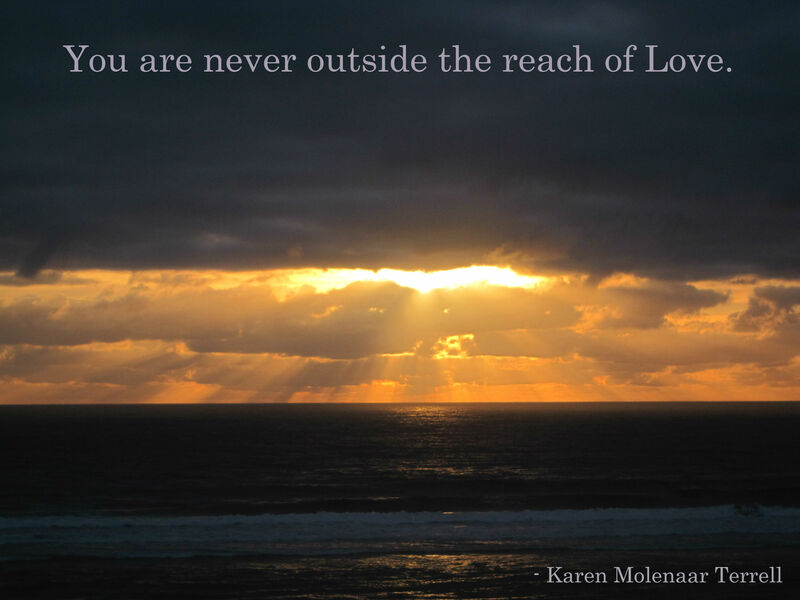 Photo of sunset in Lincoln City, Oregon, by Karen Molenaar Terrell. So there’s this tool you can use on the Amazon discussion forums that will allow you to “ignore the trolls” – you click this button and their posts go into hiding under a sign that says “You are ignoring this customer’s posts.” I myself am too curious to know what everyone else is saying to have much success using this tool, but those folks who aren’t as nosy as me sometimes use this device as a way to protect themselves from personalities they find disturbing for whatever reason. And so the fun continues. “Oh yeah?! Well, I put you on ignore first – so there!” “Well, if you put me on ignore how can you see my posts, eh?” “I unignored you so I could see your post telling me you’re ignoring me – and how can you see MY post if you’re ignoring me? !” And so on. Yeah. Good times. Good times. But I recently found a thread devoted to ignoring “trolls” that gave me some pause for contemplation. Two of the posters that the people on this thread were considering “ignoring” were actually people of education (both had doctors degrees) and intelligence – people who put some thought into their posts. One of these posters identifies himself as an atheist, the other as a Christian – and, although I don’t always agree with them, I usually find something in their contributions to the forums that makes me dig deeper into my own beliefs and thoughts about God and life. Their posts make me think… which… I don’t know… but I’ve always considered that a GOOD thing, right? Wow. I have now read through this thread. It has been an eye-opener, for sure. Yeah. I know. I am such a troll. Weirdly, this did not have the effect the other poster was probably hoping it would have on me. I found myself smirking. Not so’s she could see – but, yeah, in the privacy of my own home I was smirking. Being put on ignore by a poster simply because I questioned her stereotypes proved what I’d long suspected: We tend to ignore those people who threaten our own comfortable view of the world – we tend to ignore voices that might force us to take stock of ourselves and… yeeks!… change the way we look at stuff. And so we band together with like-minded people – isolate ourselves and insulate ourselves from differing perspectives – and find a television “news” station or other “news” source that caters to our own little conceits, and our stereotypes of others. It’s all so silly, ain’t it? How are we ever going to learn and progress if we shut ourselves off from others who challenge the way we look at things? This morning I was rooting around for a little paper clip to attach one paper to another paper that I needed to send in to a very formal, officious organization. And alas! There were no little paper clips to be found. In the entire house. Anywhere. Trust me, one does not appreciate the value of paper clips until there are none to be found. Skip forward a few hours: My car and I are now plodding our way through Bellingham in search of a parking space. My prospects do not look promising. I had not realized that I had made my semi-annual hair appointment in Bellingham on the day that Fairhaven celebrates Dirty Dan Day. As I was just about to exit a parking lot my car’s power suddenly clicked off – no steering, no brakes, no anything – I managed to make it through the exit lane – I didn’t want to clog anyone up in the parking lot. I cranked the wheel hard to the right so I could move the car off to the side a little, and pulled up on the emergency brake to keep my car from rolling into cross traffic. A gentleman named Jose and his wife were sitting in a car near by and he heard the sound my car made when I tried to start it up again. He recognized that telltale click. Jose and his wife came over to help. Jose suggested that I either had a bad battery or a bum alternator. After tinkering around under the hood for awhile, he was pretty sure my alternator had gone kapooey. He asked me if I had triple A. I said no. American Express? No. Then he asked me if my car insurance covered roadside service. We switched insurance companies just a couple months ago and I wasn’t sure if we had roadside service or not, but a quick look at my insurance card seemed to indicate we did. I called the insurance company and sure enough! – my car could be towed for free! When the tow truck arrived, little Riley came by with his folks and a fistful of balloons to watch the tow truck hoist my car onto its bed.. I got a picture of Riley posing with the tow truck. It was so fun to see him enjoying the show. My little car looked so forlorn and embarrassed sitting on the bed of the tow truck. I felt kind of bad for it. But I would not be looking for a parking place for it, and that was kind of cool. At the end of the day my husband and the sons drove up to eat dinner with me in Bellingham, and then to drop me off at the Shell Station (which actually still has a full service mechanic station – just like in the olden days!) to pick up my car. As I was getting in my car to drive it away I happened to look down on the pavement and guess what I saw?!! Yup. A little paper clip. And you can bet your bippy that I picked it up! Twenty years from now you will be more disappointed by the things you didn’t do than by the ones you did do. So throw off the bowlines. Sail away from the safe harbor. Catch the trade winds in your sails. Explore. Dream. Discover. – H. Jackson Browne, Jr.
For three years I’ve had a view of the Mount Vernon Co-op from my office window. Every now and then I’d gaze out the window and across the freeway at the friendly-looking brick building – watch the customers going in and out of it – and wonder how long it might take me to “get there from here.” I’d always thought it would be too long – that I wouldn’t be able to get there and back before a student showed up for a session with me at the alternative high school where I work. But last week I went for it. A couple of students had shown up early for their appointments with me and I found myself with an hour in the middle of the day to do some adventuring. So I donned my backpack and headed down the hill and over the overpass on a reconnaissance. When I got to the bottom of the hill I turned around and headed back to the school, and when I got to my office I realized that it had only taken 10 minutes to get to the bottom of the hill and back! The next day – knowing now that it didn’t take that long to get to the bottom of the hill and back – I ventured a little further. This time I actually went into the Co-op. I ordered a peach smoothy and brought it back to my office with me. The clock showed that I had only been gone from my desk for 20 minutes! Since that day I have managed to find time every day to hike down to the Co-op for my peach smoothy, a little exercise, some fresh air, and a quick hobnob with the co-op community..Yesterday I ran into a former teaching colleague and a woman who lived down the street from us 30 years ago – that was way fun. And today I ran into a former student from ten years ago who’d just returned from a trip to Thailand. 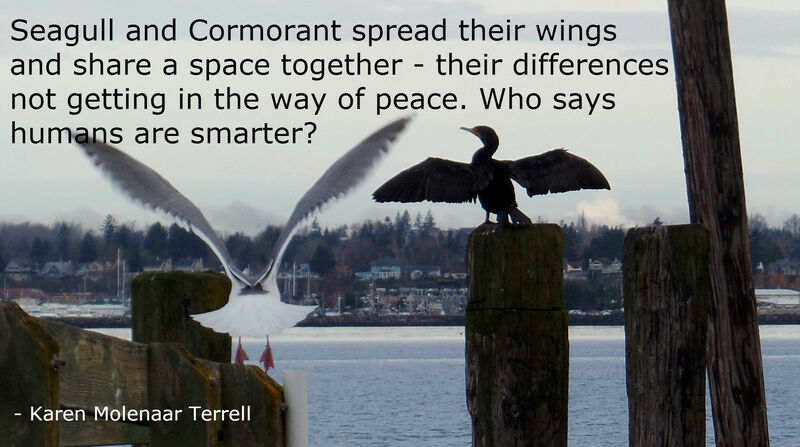 And this was kind of cool – as I was walking down the hill to go to the co-op this morning, I saw a man approaching me carrying a sign that said “Peace” on it. As we got 30 or 40 yards from each other we both smiled simultaneously at each other, and I held up my fingers in the “peace sign.” He returned the “peace sign” to me, and then veered off the sidewalk to go to the co-op – me following behind him. I am really enjoying my daily Co-op break. I wonder who I’ll run into next time? 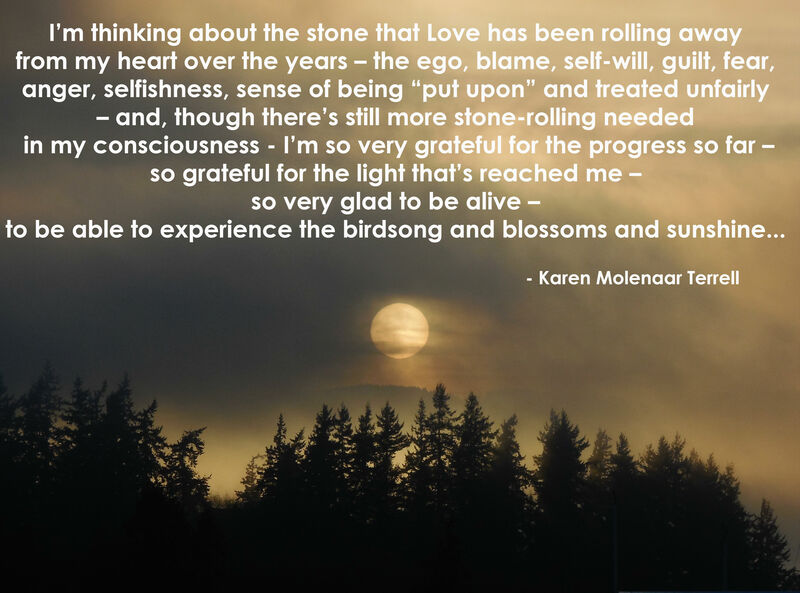 Sing of hope and faith uplifted; Love has rolled the stone away.